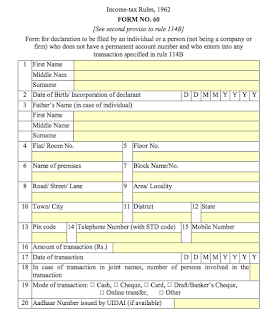 As per second proviso of Rule 114B (Transactions in relation to which Permanent Account Number is to be quoted in all documents for the purpose of clause (c) of subsection (5) of section 139A of the Income-tax Rules, 1962 (hereunder referred to as the Rules), any person who does not have a Permanent Account Number and who enters into any transaction specified in this rule, shall make a declaration in Form No. 60 giving therein the particulars of such transaction either in paper form or electronically under the electronic verification code. 2. As per sub-rule (1) of Rule 114D (Time and manner in which persons referred to in Rule 114C shall furnish a statement containing particulars of Form No. 60), the persons referred to in clauses (a) to (k) of sub-rule (1) of Rule 114C and sub-rule (2) of Rule 114C shall furnish a statement in Form 61 containing particulars of declarations received in Form 60 to the Director of Income-tax (Intelligence and Criminal Investigation) or the Joint Director of Income-tax (Intelligence and Criminal Investigation) through online transmission of electronic data to a server designated for this purpose and obtain an acknowledgement number. 3. Rule 114B of the Income-tax Rules, 1962, provides that the declaration in Form No.60 can be submitted either in paper form or electronically under the electronic verification code in accordance with the procedures, data structures, and standards specified by the Principal Director General of Income-tax (Systems) or Director General of Income-tax (Systems). 4. In exercise of the powers delegated by Central Board of Direct Taxes (‘Board') under Rule 114B of the Income-tax Rules, 1962, the Principal Director General of Income-tax (Systems) hereby lays down the following procedures for submitting Form No. 60. 5. An individual or a person (not being a company or firm) who does not have a permanent account number and who enters into any transaction specified in under Rule 114B of the Income-tax Rules, 1962, shall either submit Form No. 60 physically in paper form as per the existing procedure or electronically using electronic verification as per any of the procedure stated in para 6. 6. Under electronic verification, the individual or a person (not being a company or firm) who does not have a permanent account number and who enters into any transaction specified in under Rule 114B of the Income-tax Rules, 1962, shall make a declaration in Form No. 60 giving therein the particulars of such transaction electronically using electronic verification. a) The electronic verification can be enabled using electronic portal/application approved for transactional facility by the regulator. i. Type 2 Authentication - Authentication of residents through OneTime-Password (OTP) delivered to resident's mobile number and/or e-mail address present in CIDR. ii. Type 3 Authentication - Authentication of residents using one of the biometric modalities, either iris or fingerprint. iii. Type 4 Authentication - Authentication of residents using 2-factor authentication with OTP as one factor and biometrics (either iris or fingerprint) as the second factor. iv. Type 5 Authentication - Authentication of residents using OTP, fingerprint & iris together. 7. The person using electronic method of submitting Form No. 60 and electronic verification using any of the methods listed above, may submit Form No. 60 in paper form where electronic verification is not possible due to Information Technology related issues. a) In cases where the requirement for furnishing of a PAN or Form No. 60 are triggered in multiple transactions during a financial year relating to the same person, the person responsible for collecting Form No. 60 may collect only incremental information provided the linkage of subsequent transaction is established with the earlier captured information for which an initial consent shall be obtained from the declarant of Form No. 60. 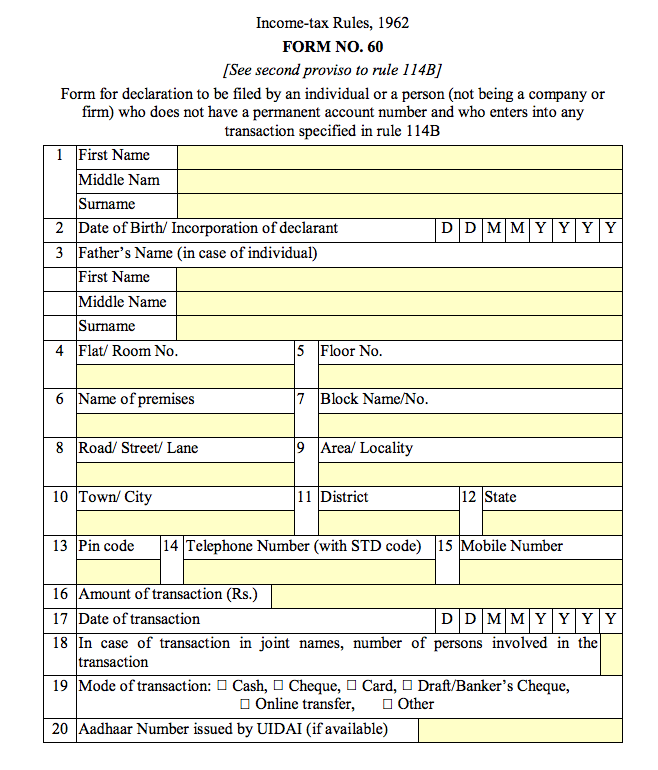 Details of each such transaction shall be required to be reported in Form No. 61 as per Rule 114D of the Income-tax Rules, 1962.
b) Every declaration in Form No.60 should be assigned a unique number. c) In case multiple Form No. 60 are submitted during the financial year, and the person/transaction becomes reportable in Form No.61A, the acknowledgement number of the last submitted Form No. 60 shall be mentioned in Form No. 61A. 9. Security, archival and retrieval policies: The reporting person is required to document and implement appropriate information security policies and procedures with clearly defined roles and responsibilities to ensure security of submitted information and related information/documents. The reporting person is also required to document and implement appropriate archival and retrieval policies and procedures with clearly defined roles and responsibilities to ensure that submitted information and related information/documents are available promptly to the competent authorities.